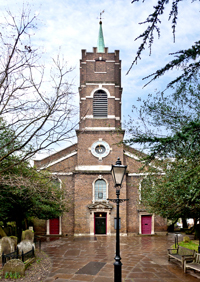 The church is in the North Camden deanery, which covers the original borough of Hampstead and, together with the South Camden deanery, the present London Borough of Camden. Through the deanery chapter (for clergy) and synod (for clergy and lay members) all the CofE churches in the deanery are able to discuss current concerns and to co-operate and support each other in developing the mission of the church in this area. Between them, the deanery churches seek to provide a diverse range of services and activities to meet the differing needs of our communities.